Every day, millions of Americans missing natural teeth rely on dentures to eat, speak and smile like normal. Indeed, a majority of Americans over the age of 55 wear full or partial dentures, according to the National Health and Nutrition Examination Survey. However, just like a car needs the right level of oil and gas to keep running smoothly, dentures also must fit properly in one’s mouth to feel comfortable and function properly. Do your dentures frequecntly slipp in your mouth? Keep reading to learn how to achieve outstanding stability and superior denture comfort in Ocala. Dentures are a set of artificial teeth and gums that can help individuals who have a lost a significant number of teeth to eat, speak and smile with confidence. 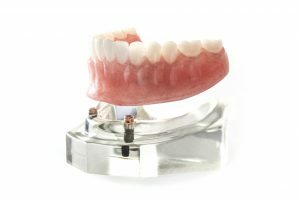 Both full and partial dentures are custom-made from hard resin and acrylic to match the size, shape and color of a patient’s natural teeth and gums. Although not as strong as natural teeth, a denture in Ocala is a reliable and popular tooth replacement solution. Gagging – Dentures that are slightly too big often contact the throat more than usual, triggering the gag reflex. Slippage – Dentures that do not fit snugly in the mouth may slip when eating or even just when smiling. Frequent slippage may be a sign that your dentures need to be relined or replaced. Persistent Pain – Dentures that fit unevenly in the mouth cause an uneven balance of bite forces, which can make it painful to chew food. For patients who consistently struggle with or worry about denture slippage and other similar problems, implant-supported permanent dentures can offer superior stability for replacement teeth. Unlike a regular denture, which rests on the gums, implant-supported dentures are attached to and supported by titanium implants placed in the jawbone beneath the gums. By mimicking the natural tooth root structure, dental implants in Ocala can provide maximum support to permanent dentures. Candidates for this type of restorative dentistry solution must have enough bone in the jaw to support implants. Achieve the comfortable, confident smile you deserve with properly-fitting dentures and implant-supported dentures in Ocala. Talk to a dentist today to find out which option is best for you to restore your smile. Dr. Daniel Weldon is dedicated to providing superior dental care to individuals and families in Ocala, the community that he calls home. The University of Florida College of Dentistry graduate recently became a master in the International Congress of Oral Implantologists. Patients who wish to know more about all types of dentures can visit the Weldon General & Cosmetic Dentistry website or call Dr. Weldon at 352-622-3236.